From code to copy, and Information Architecture to Accessibility, InterACT with Web Standards: A holistic approach to web design provides readers with an invaluable perspective of how the various facets of the web design profession fit together. Brought to you by the the people that power The Web Standards Project. The book is published by New Riders (2010) in the Voices that Matter series. There are 10 authors, with me among the list. The major contributor being Chris Mills, with additional expertise from Erin Anderson, Virginia DeBolt, Derek Featherstone, Lars Gunther, Denise Jacobs, Leslie-Jensen-Inman, Christopher Schmitt, Glenda Sims and Aarron Walter. 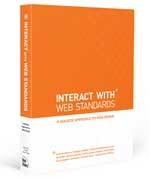 The InterACT with Web Standards book site has everything you need to know. There, you'll find links to purchase the book, links to code examples from the book, links to bonus content, and links to the sample project. The site has links to information about InterACT, OWEA, and the Web Standards Project. You can take a peek inside the book, read some reviews, grab links to all the resources cited in the book, and MUCH MORE. This book is more in depth, with more complex exercises, new chapters, new examples and new techniques. It is aimed at independent learners and has many features making it ideal for classroom situations. There are chapter exercises, test banks, Power Point slides and other helpful material for classroom use. Although it is part of the Mastering skills series, the book starts from the beginning and takes readers all the way from basic to advanced. Of the two "integrated" books, this is the best choice if you only want to get one of the two. I've been critical of the method and organization of most books that teach HTML and Dreamweaver on my Web Teacher blog, because I believe there is a better way to approach CSS. Almost the instant that students manage to get one word to appear on a web page, they start demanding to know how to make it look better: how to change the color or the font or the placement. The only way to meet those demands with standards-based code is by using CSS. Having the awareness of what you intend to do with CSS as you create XHTML helps you write web pages that are CSS-ready. It helps you structure your pages with various hooks, handles, and holders meant for styling with CSS. Learning to write XHTML with CSS in mind helps you design pages that work in modern browsers, download quickly, are accessible, and hold up well over time. These are design skills that help students when they reach the job market. 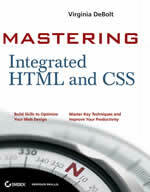 This book is for beginners in HTML and CSS, or for people who already know HTML but are beginners at CSS. Adobe Dreamweaver CS4 Classroom in a Book. This book is officially the product of the Adobe Creative Team, which includes quite a number of people including several editors and other people at both Adobe and Peachpit Press. For this edition of the book, I wrote some new lessons and revised some of the previous lessons. I was under the impression that my name would not be mentioned in the book. So I was pleasantly surprised to see my name in small print on the copyright page as writer. If you are a Dreamweaver beginner, or want to learn about the latest features in this version of Dreamweaver, consider using this book as your guide. It's my longest ever Web Teacher Tip. How to Create a Responsive Web Site Using Dreamweaver CS 5.5. 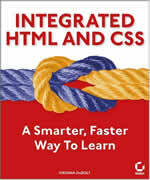 This e-book explores responsive layouts and media queries Dreamweaver style. The Essentials for Design series from Prentice Hall includes Macromedia Fireworks MX 2004 Comprehensive by Sharon Lettvin Neville, for which I wrote supplemental material. I helped authors Tom Negrino and Dori Smith with Macromedia Dreamweaver 8 for Windows and Macintosh: Visual QuickStart Guide (Visual Quickstart Guides) . My work in that series has continued to appear in subsequent editions. Stylin' with CSS: A Designer's Guide (2nd Edition) (Voices That Matter) by Charles Wyke-Smith.